It’s easy to think Georgia’s mountain communities are all the same – forests, waterfalls and lakes, quaint towns with gift shops and restaurants boasting “country cooking” – but Mitch Griggs, executive director of the Union County Development Authority (UCDA), says not so fast. Though tourism will likely always be king of the county and its sole municipality, Blairsville, Griggs and other community leaders are positioning Union County for a bigger piece of the economic development pie through a combination of downtown redevelopment, strategic use of Special Purpose Local Option Sales Tax (SPLOST) funds to make capital and infrastructure improvements and an aggressive pursuit of prospects in manufacturing and industry. The last item became more likely with the advent of the North Georgia Network (NGN), an independent, open-access fiber-optic system providing broadband infrastructure for telecoms and wireless companies. The NGN was a result of development authority professionals in Dawson, Forsyth, Lumpkin, White and Union counties brainstorming about how to attract business and industry. “We were all challenged with economic development, because we’re all relatively small with limited labor forces,” says Griggs. When the economy tanked in 2008, they assumed the project would, too. Instead, the federal government created the American Recovery and Reinvest-ment Act (ARRA), making funds available through the National Telecom-munications and Information Admini-stration (NTIA) under the organization’s Broadband Technology Opportunities Program. Instead of a modest $4-million project, the network expanded to in-clude Habersham, Rabun and Towns counties. In 2009, the network was awarded the first grant from the NTIA, $33 million, to build a 260-mile fiber optic network. The balance of the funds, $9 million, came from the state, electric utilities and local communities. As a result of the network, which was completed on schedule in Novem-ber 2012, the region located its first data center – though not in Union County. “We’re excited about it, though, be-cause these things tend to cluster, and now our region is on their radar screen,” Griggs says. “Data centers are a major recruiting goal for us. We’re working closely with allies at the state and federal level, primarily TVA, on some data center initiatives. Speaking of streets, there’s excitement aplenty on the square in downtown Blairsville, anchored by its c. 1899 courthouse, now that the long-awaited streetscape project broke ground in mid-April. The plan calls for crafting a defined, walkable city center by creating eight-foot-wide sidewalks of stamped concrete and brick pavers and adding crosswalks, angled parking and landscaping beds to break up the asphalt. The project has been in the works since 2008, when the Downtown Devel-opment Authority (DDA) first applied for a Transportation Enhancement (TE) grant, federal funds administered through the Georgia Department of Transportation. They received $250,000 to start the process, hire a designer and put the plans together, then applied for the additional amount to complete it. They received $245,000 in the second round and got notice to proceed with construction in March 2013. The project is expected to be complete by September. The second major piece of downtown redevelopment is located just be-hind City Hall on a seven-acre tract of undeveloped land that was purchased by the DDA with backing from the city. Tentative plans call for greenspace, public parking, public restrooms and some commercial development. They’re also hoping to create a gateway into the city by gaining access off Highway 515, slicing through the property and connecting to Highway 129, one block from the square. The city is also investing in infrastructure improvements to increase efficiency in public works. In July, officials will let a bid on a project to replace and increase the size of aging water lines. They’re also replacing all the system’s water meters, upgrading to radio-read meters. The Blairsville Municipal Airport, operated by the city, recently extended its runway to 5,000 feet. This spring it began a project to relocate the terminal from the south side to the north side of the runway. Paving will be done this year, and next year the airport will start construction on a 5,000-square-foot terminal. Funding for the project came from federal and state sources; the cost is expected to be around $900,000. Lamar Paris serves as sole commissioner of Union County and is an unabashed advocate of SPLOST. Union County enjoys the fourth lowest tax rate in the state; SPLOST has proven a useful tool to make infrastructure improvements. “We feel like we’re doing our part to hold taxes down,” says Paris. Other high-profile SPLOST projects included a $1-million renovation of the county’s library, doubling the space and adding state-of-the-art improvements. More than $2.8 million went toward resurfacing, paving and maintaining 600 miles of country roads. Thirty acres of undeveloped land, with more than one-and-a-half miles on Butternut Creek and Nottely River, were purchased for $1.25 million and added to the existing 95-acre Meeks Park. SPLOST funds paid for additional emergency service vehicles and a new addition to the firehouse used by the full-time fire department; most mountain communities rely on volunteer fire departments. A major addition to the community, paid for with SPLOST dollars, is the Union County Farmers Market and Canning Plant. Open since 2011, the market is situated on a nine-acre site with two pavilions. The immensely popular market is held twice weekly. “Even when people don’t need to buy anything, they come to the market to see folks,” says Mickey Cummings, county extension coordinator for Union County, who also serves as the market’s manager. He estimates the market averaged 100,000 visitors during its June through October, 22-week 2012 season. The canning facility opened last September and was open just one month before closing for the season. More than 200 people processed 6,000 jars of produce in just one month’s time. This year Cummings expects at least 250 to 300 patrons will process around 20,000 or more jars. “Hopefully we’ll be able to take it a step further to allow farmers and other local growers to can commercially,” he says. An Education SPLOST (ESPLOST) was overwhelmingly passed by Union County in March. The school district, which operates five schools, plans to purchase land and construct new facilities, including additional classrooms, a field house and a multi-use auditorium. The ESPLOST is expected to generate $21 million over the next five years. The school system partners with North Georgia Technical College (NGTC), which has a campus in Blairsville, to offer dual enrollment programs for high school students as well as serving as a conduit for students on any education track, whether earning a certificate, an associate’s degree or just taking core classes before moving on to another institution. The relationship continues with business and industry offering internships to students and advising NGTC on how to keep their programs strong and current. The college will soon expand its footprint and influence by building a health sciences building at the Blairs-ville campus to house the school’s practical nursing and medical assisting programs. The project was approved by the Georgia legislature this past session and is expected to cost $4 million. Thaxton says she is hopeful this will mean expansion of the school’s registered nursing program to Blairsville in a couple years’ time. Though the recession certainly discouraged business and industry pro-spects from site shopping, Griggs says things are starting to pick back up. 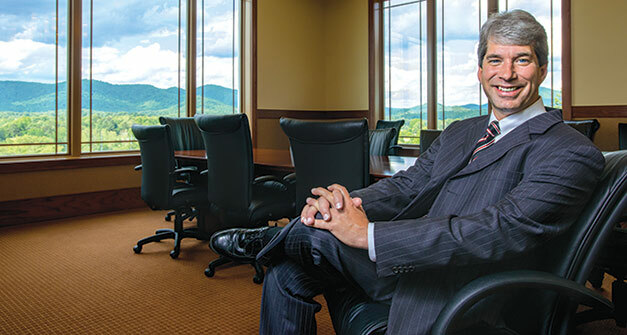 Advanced Digital Cable, a North Carolina company that manufactures cabling for assorted applications, moved into a 140,000-square-foot facility in the Blairsville Airport Regional Industrial Park (BARIP) in 2011. They currently have 30 employees but plan to more than double that by year’s end. The UCDA wasn’t idle during the downturn, helping the county earn the Certified Work Ready designation in 2012 and building a unique spec building at the BARIP. The building, which is split into two 8,000-square-foot halves, has a 25,000-square-foot footprint on the nine-acre site. It can be developed as two buildings or joined together for prospects needing more space. Other existing industry expanded in 2012. Lamin-x Protective Films, a manufacturer of adhesive-backed products designed to protect surfaces such as high-end automobile headlights or windshields from damage, is located in Union County’s Robert Jones Industrial Park. Lamin-x Founder and CEO Chris Wadle started the company in his home in 2002 and now has more than 40 employees. Last year Wadle bought out his Canadian supplier and relocated the company to Blairsville.